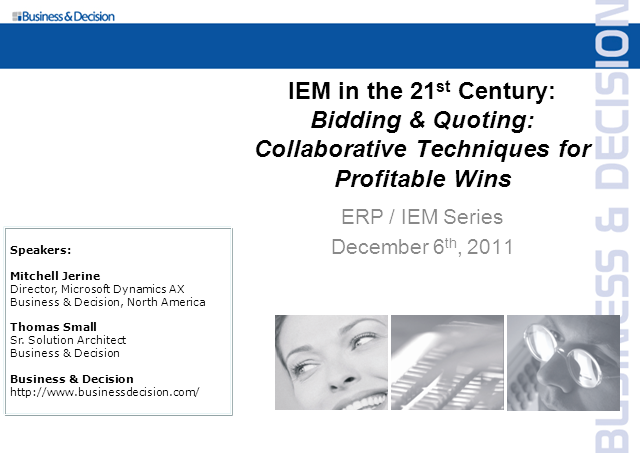 Explore advanced collaboration techniques and tools for more accurate, accelerated bids and quotes. In just 30 minutes, learn how your sales force can speed up the bidding process, how to efficiently manage the bidding process across departments, how to integrate PLM with ERP, how to effectively manage subcontractor bids and more. This is the second in a series of five online webcasts offered by Business & Decision designed to help industrial manufacturing executives gain strategies for more wins, bigger profits and greater stability.